Gift Card - Choose Your Amount! - Gift Cards ♥ Cute-Stuffs.com! ♥ Kawaii Shop - Phone Straps, Charms, Dust Plugs & More! 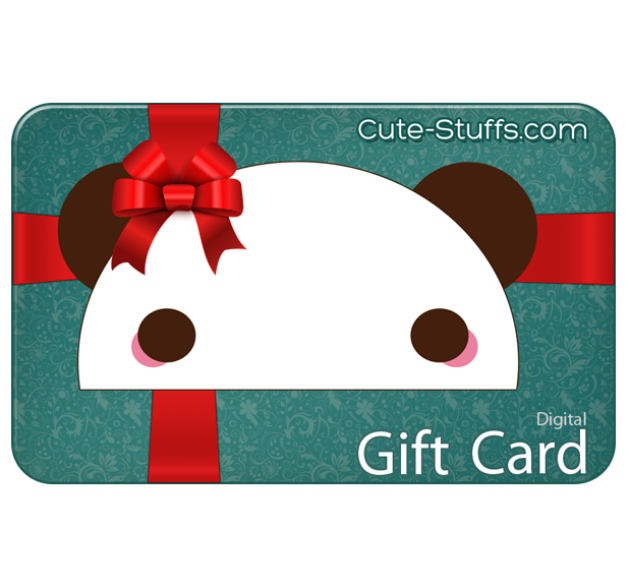 CUTE-STUFFS.COM DIGITAL DELIVERY GIFT CARD - CHOOSE YOUR AMOUNT! Treat your friends or family to a Cute-Stuffs shopping spree with a Cute-Stuffs.com Digital Gift Card! This card can be used to purchase any product on Cute-Stuffs.com and is also applied to shipping charges during checkout! Our gift cards do not expire and can be used by anyone - whenever, and wherever, as we ship worldwide! Please see below for instructions on sending and redeeming gift cards! You want to send a gift card? Great! Follow these simple steps! Lucky you! You got a gift card and want to go on a Cute-Stuffs.com shopping spree? It's easy - here's how! You will receive an order confirmation upon completing checkout, and as always, we will update you when we ship your order, complete with tracking!